Construction materials leader AfriSam dominated at the recent Southern African ReadyMix Association (SARMA) awards by winning two of the four accolades bestowed on the industry’s top performers for 2017. 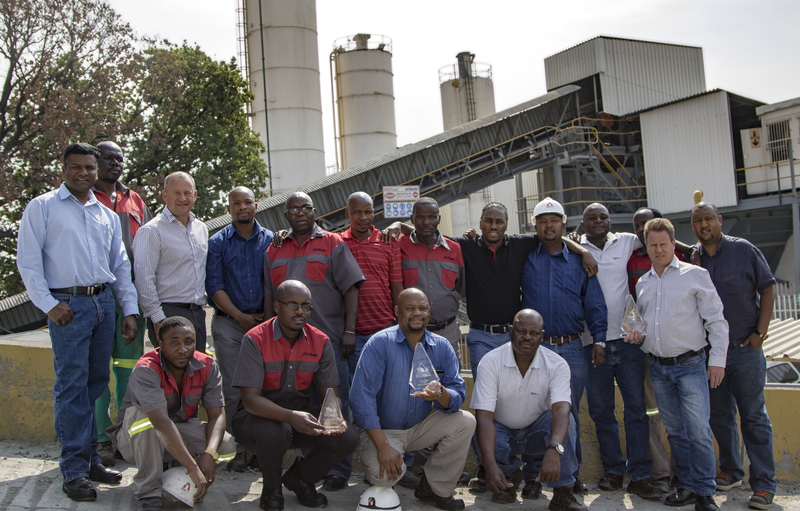 SARMA’s premier annual event – held in Gauteng during the Concrete Conference in August – saw AfriSam walk away with both the Best Plant award for its Wynberg readymix facility and the Best Fleet award for its Gauteng readymix fleet. “The team is justifiably excited about winning this prestigious honour,” says Kevin Naidoo, AfriSam’s operations manager for the company’s central cluster which includes the two large plants that share the site at Wynberg. Naidoo says it was a significant achievement given the size and output of the Wynberg plants, which are among the busiest in the country. These plants serve the fast growing region that encompasses Sandton and Rosebank. “There is an added pressure on a plant when its production demands are high, and we feel proud that we can maintain such high levels of safety, quality and other standards while still meeting the output that our customers need,” he says. The SARMA awards are based on detailed compliance audits that measure safety, health, transport, environment and quality at members’ readymix plants. The wide range of criteria includes hazard identification, risk assessment, legal requirements, communication, participation and documentation. Being strategically placed in the business heartland of the country also means that the Wynberg plants are producing concrete for many of Gauteng’s new high-rise developments. This, in turn, puts them at the cutting edge of sophisticated concrete products and mixes; specially designed for the high performance requirements of these buildings. “Quality and consistency are therefore vital in ensuring that we meet specifications at all times, while delivering on time under all conditions,” says Naidoo. On the transport side of the business, AfriSam’s outbound logistics manager Rob Sansom says it was a great reward to be recognised as the best fleet. He highlights the effort invested in keeping trucks clean through methods that are both environmentally sensitive and water saving. Specially researched chemicals are used to clean trucks without damaging the environment or the truck itself. Water is reused in the cleaning process – first for the outside of the vehicle, secondly for washing out the drum, and thirdly in the actual batching of concrete in the plant. This keeps the company firmly compliant with Green Star requirements on construction sites. Vehicle checks are strictly applied, so the Gauteng contractors who are appointed to run the branded readymix trucks must have them inspected every three months at AfriSam’s transport depot in Spartan. According to Amit Dawneerangen, AfriSam’s general manager (readymix), the SARMA awards represent a highly prized acknowledgement – from the experts in the concrete industry – that a company is at the top of its game.